TMG is used to improve the performance properties of gas without changing its physico-chemical parameters. The gas is modified by mixing the modifier with the gas. In the first modification, the amount of modifier is calculated basing on the amount of gas remaining in the tank and the volume of gas in the tanker container. The subsequent modification of gas is carried out only taking into account the volume of gas in the container of the tanker. The gas is modified during the transfer time at a temperature from -30 to +45 C. Changes in temperatures do not affect the properties of the modifier. The opened container with TMG should be stored with a tightly closed lid. TMG is a low-viscous blue liquid readily soluble in hydrocarbons. Handling the product does not require special precautions. ● fat-soluble dye GOST 4770-77. Expiration date — 3 years from the date of production. ● continuous cleaning of the catalyst and exhaust system. 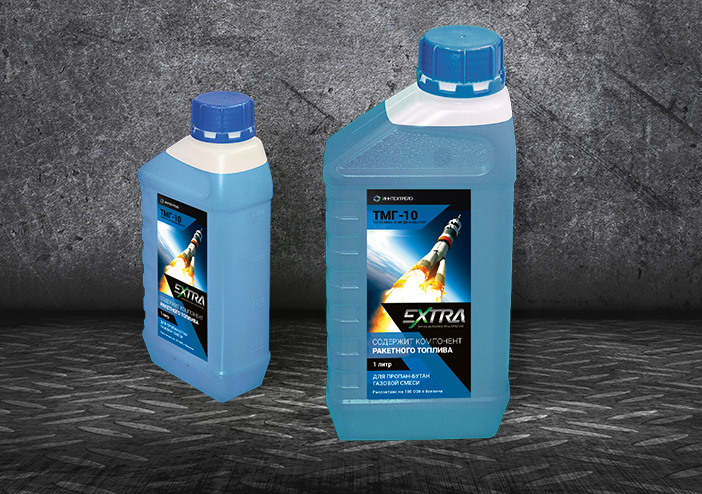 ● anti-corrosion and lubricating effect. * The evidence is confirmed by an expert opinion from leading Russian universities.